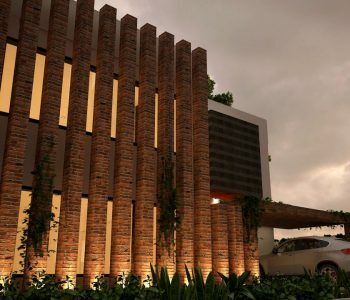 The owner of this one kanal house called Archi-cubes, an Architecture Firm which has one of the Best Architects in Lahore, and asked for a home with a modern, unique atmosphere, with nicely decorated and perfectly separated bedrooms, a comfortable kitchen, inside terrace and decoration. The request for natural light to enter the house also determined the concept of the layout. 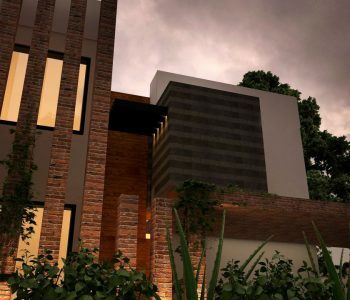 Therefore,the client was entertained and Archi-cubes designed the house fulfilling the client’s requirement, the 4500 square feet house was then designed on modern lines. The façade was designed to accommodate the natural light together with some privacy from outside, the twelve-horizontal concrete-core free standing columns, parallel and one and a half feet distant to each other were designed covered with brick faced tiles allowing the natural light to enter the home.The decoration contains many natural materials, the mood is basically determined by many brick surfaces, beautiful ceramic split faced grey tiles, fair-faced concrete walls and exquisite wood flooring. The different textures were perfectly matched to each other. Archi-cubes is an Interior Design Company Lahore and Archi-Cubes is well known for its Best Interior Designer in Lahore. The inside separation of the zones was solved with brick walls and high gloss flooring that helps to better disperse natural light. The floor plan was designed to provide an optimal distribution for the young family with three separate children’s rooms with separate washrooms, separated bedroom for parents with a vast double heighted living space comprising of wide windows, a small foyer and optimal storage spaces. It has all the important functions with unusually high comfort and luxury feel. The outside space was well utilized by a landscaped garden and a porch entertaining two big sized cars at a time. The grassy area was accessorized with beautiful plants consisting of creepers that were growing along the ground and climbing up the free-standing columns putting life to the building, because gardening is not as simple as it looks without the relative planning. The architect paid strong emphasis on the lighting, the light and shadows play even more special atmosphere in the evening.